English: Train station with train and coal depot. Signed “Gustave Le Gray”. Svenska: Tågstation med tåg och en koldepå. Signerad “Gustave Le Gray”. Source Original from the Victor von Gegerfelt collection, Volume K 1:3, Region- och Stadsarkivet Göteborg. Scanned by Uno Lindström, Göteborgs Fotostudio, 2006. Please contact us if you have more information about the picture! 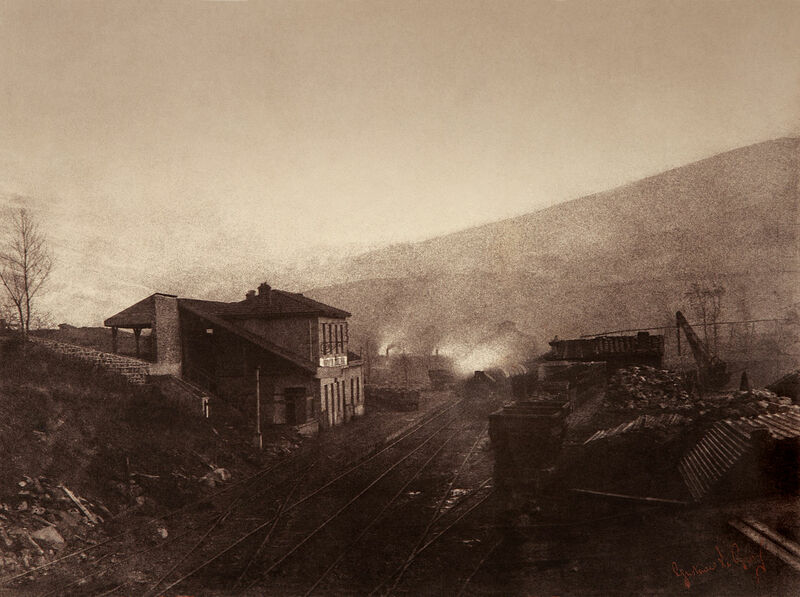 Other versions Restored version of File:Train station with train and coal depot by Gustave Le Gray.jpg. Dirt and scratches removed. No other changes. This version retained in case additional edits become necessary. See also File:Train station with train and coal depot by Gustave Le Gray2.tif (full restoration, uncompressed) and File:Train station with train and coal depot by Gustave Le Gray2.jpg (full restoration, compressed).